Baseball, beer and the 600 ft arch are a few of the famous things St. Louis is known for. And barbeque ribs, too. But how about Gooey Butter Cake? Yes, it’s a St. Louis tradition with deep roots in this midwestern town. Legend has it, around the year 1930, a German baker added too much sugar, butter or shortening to his cake batter and when it came out of the oven, his wife took a bite and proclaimed, that’s gooey. People liked it and the cake suddenly became a mainstay in St. Louis. Variations began to pop up in sections of the city and over the neighborhood fence, recipes were shared. Since I had an upcoming trip to this part of Missouri, I decided to bake the cake at home. I began my recipe search for the cake by making the “Real St. Louis Gooey Butter Cake” from Chris Leuther’s collection of old St Louis bakery recipes. The recipe calls for a yeast crust and has a rich filling made with milk, eggs and butter. After following the recipe as described and being careful not to over bake it, the sweet treat was deemed a winner. Now I was excited to experience the cakes in its birth place. Helfer’s Pastries and Deli claim to have the “original” recipe. The old-time bakery owned by Chris and Kathy Helfer is in Florissant, a suburban community just outside of the city. When I drove into the town, I felt as if I was seeing a picture in an American magazine from years back. I met Chris over the curved glass counter and he told me a bit of history about the bakery. Chris and his wife Kathy started their journey together in a Missouri bakery 41 years ago and a few years later came back to his hometown of Florissant where their bakery has flourished. It’s a family business with their four daughters also mixing the dough. Chris told me his cake recipe was handed down from a retired baker and the cake is a continuous staple item. Besides the traditional plain flavor, they offer seasonal flavors such as pumpkin and the popular cinnamon pecan. If a whole cake is too much, they also have shortbread cookies and pecan rolls with the gooey filling. I opted to eat the gooey butter bites which were puffy square cookies, loaded with gooey filling and rolled in powdered sugar. These quick bites made it seem innocent enough to keep popping them in my mouth. The Helfer’s know Missourians like freshly baked gooey butter cake and even ship the cake to many loyal customers. Chris proudly told me his cake has a yeast raised crust and no cream cheese in the filling because this is the true gooey butter cake. They obviously have a tried and true recipe. When Park Avenue Coffee Company started roasting their own beans in 2006, the coffee company became known as a cool place to grab a cup and chill for a while. Locally owned by brother and sister Marilyn Ann Scull and Dale Allen Schotte, they decided it was time to offer sweet treats to customers. Mom’s “original” gooey butter cake recipe was the answer. It didn’t take long before word spread about the cake and the popularity of the cake grew. The secret is cream cheese in the batter and a crust that holds in the gooey filling. Dale told me the cake has emotional ties for those who grew up in St. Louis with fond childhood memories. Varieties of recipes have circulated around neighborhoods for many years and competitions were held to taste the best of the best. But the time had come to change it up from the traditional flavored cake. Now, over 70 different flavors are offered with many flavors gaining status under their Ann and Allen Baking Co name. Turtle cake sounded like something a bit edgy and it did taste delightful with caramel and pecans. Out of towners can order one of the 25,000 cakes shipped yearly or buy an Ann & Allen box mix ready to make at home. 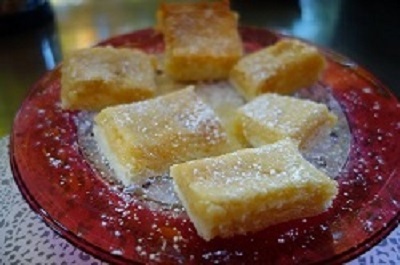 Gooey butter cake has loyal fans in St Louis and whichever version is a sweet winner.